Our regular pilgrimage to Little Italy for pizza at Mama Santa, then over to the Cleveland Museum of Natural History to view the Our Global Kitchen exhibit and the cool outdoor Perkins Wildlife Center. I took Malia and Oliver for a drive in the Metroparks, with a stop at the Rocky River Nature Center and a climb up the new Fort Hill Steps (155 in all). We met up with the cousins for a cold afternoon of tobogganing at the Metroparks Chalet. 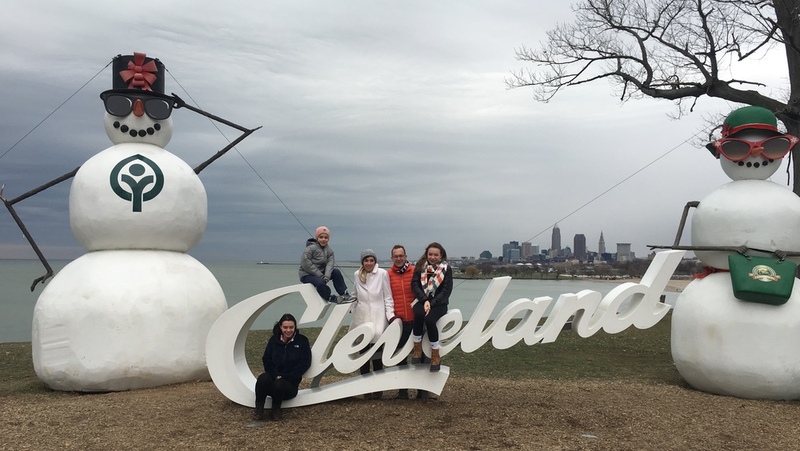 Oliver and I visited the West Side Market this morning, eating our donut and bagel up on the observation bench; then the family met our good friend, Butch, for brunch in Rocky River; on our meandering way home, we popped out at Edgewater Park for a photo with the Cleveland sign. Later, I stopped into Breadsmith in Lakewood, and my best friend, Joe, was on his way out. I’d canceled our breakfast earlier in the week, and here fate had brought us together, if only for a minute of conversation. 2016 was a good year, an active year, a challenging year, a depressing year, and a celebratory year. I’m glad it happened, and I’m glad it’s over. 2017 is here, and I’m planning to spend it playing as much soccer as my body can take, visiting the gym to build strength, and finally getting my storytelling project off the ground. There’s also a work trip to Puerto Rico and spring break on St. Croix; a Zuiker Family Reunion in the mountains; a brother’s wedding in Mexico; big goals for my job and plenty of family priorities and projects. And whatever else comes my way.